Allen Iverson won four league scoring titles with the 76ers and was named MVP in 2001. PHILADELPHIA (AP) — Allen Iverson cupped his hand to his left ear and asked to hear his favorite tune one more time. With that command, 20,000 roaring Philadelphia 76ers fans gave AI the standing ovation he earned by stamping himself as one of the franchise’s all-time greats. Iverson, emotional as he thanked former teammates and friends, had his No. 3 retired at halftime of Saturday’s game against Washington. High above the Wells Fargo Center court, Iverson’s banner slipped between Maurice Cheeks’ No. 10 and Charles Barkley’s No. 34. 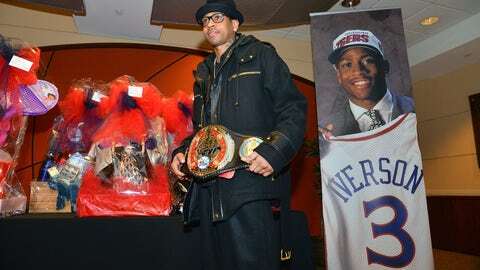 Iverson officially retired in October after last playing in 2010. He won four scoring titles for the Sixers and was the 2001 MVP when he led them to the NBA Finals. He never won a championship, the lone omission in a career that is destined for the Hall of Fame. The Sixers may as well have turned the arena into an AI museum. Four banners greeted fans at the main concourse entrance, and photos of him were plastered all around the arena. The merchandise stands sold Iverson jerseys for $130, and lower level tickets were going for as much for $1,280 on Stubhub about an hour before the 7:30 p.m. tipoff. The fans loved him, and he blew them kisses after the No. 3 was raised to show how much he loved them back. Iverson’s return injected a rare dose of excitement into a franchise playing some of the worst basketball in the league. The Sixers, in full-blown rebuilding mode, had lost 12 straight entering Saturday’s game. The losing didn’t matter much Saturday, just the memories. The Sixers wore special ”Iverson Forever” patches on their jerseys and Iverson’s 3 on their pregame warmup shirts. ”It’s a great example of how this city responds to somebody that they clearly think the world of and brought such exciting times to the city of Philadelphia,” Sixers coach Brett Brown said. Iverson joined Cheeks, Barkley, Wilt Chamberlain and Julius Erving among the eight retired numbers in franchise history. Erving attended the ceremony. Moses Malone, Dikembe Mutombo, Theo Ratliff, Gary Payton and former team president Pat Croce also were at the celebration. Former coach Larry Brown, who both clashed with and loved Iverson over their tenure, sent a videotaped message. ”I just want to tell you, and I say this fondly: God put me there to coach you,” Brown said. Iverson said Brown was the player who molded him into one of the NBA’s best. Iverson was the No. 1 overall pick in the 1996 draft and spent his first 10 seasons in Philadelphia. He also played for Denver, Detroit, and Memphis before returning to Philadelphia for a 25-game stint in 2009-10. Iverson, who mashed hip-hop culture and hoops like no player before him, was perhaps at his peak in his fifth NBA season. The 165-pound guard averaged 31.1 points, was the MVP of the All-Star game and propped an entire franchise on his 6-foot frame all the way to the finals. Led by Brown, the Sixers needed Game 7 wins in consecutive series for the right to play the Lakers. Shaquille O’Neal, Kobe Bryant and the Lakers swept their way through the postseason before Game 1 in Los Angeles. Iverson had 48 points in 52 minutes of an overtime victory. The Sixers didn’t have enough to go the distance and the Lakers won the next four games. He’s 21st on the NBA’s career scoring list with 24,368 points over 914 career games. Iverson, drafted out of Georgetown, scored 30-plus points 345 times and was an 11-time All-Star. His No. 3 jersey was a best seller around the globe, the headband wrapped snugly around his cornrows, and the tattoos were as much a part of his image as the way he ricochets around the court. Play every game like it was his last was more than a catchphrase, it was a lifestyle. NBA Commissioner Adam Silver was at the game for AI’s night.